Spring has finally sprung, which means it’s time for our FOURTH annual Edible Books Contest! Members cooked up a delicious batch of literary confections and concoctions last year, and we’re expecting another strong showing for 2015. 2. Document your masterpiece. 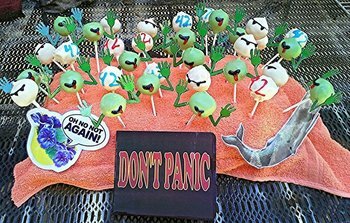 At right is the grand-prize winner from last year’s contest, inspired by The Hitchhiker’s Guide to the Galaxy. You can see other submissions from last year in the EdibleBooks2014 gallery (and here’s 2013 and 2012). If your creation is super realistic, take a photo cross section of your creation as you eat it! 3. Upload the photo to your LT member gallery. Sign in, then go here and click the “Add another picture” link to add the image. 4. When adding the image, be sure to tag it “EdibleBooks2015.” Yes, those capital letters are important. This will add your image to the contest gallery, and counts as your entry. If your photo doesn’t have that tag, we won’t know that you’ve entered. You can see current entries here. DEADLINE: The contest will run for just over three weeks. Add your photos by 6pm Eastern on Sunday, April 19th. As always, we will pick a few Honorable Mentions from the batch of entries. The more entries we receive, the more Honorable Mentions we can make—and all of them will get lifetime gift memberships, too. Fine Print: You can enter as many times as you like, but you can only win one prize. Your dish must be made of edible ingredients (no hats, lost-wax sculptures, performance art), and by entering the contest you certify that it is your own creation. Entries submitted to previous LibraryThing Edible Books contests will not be considered. All decisions as to winners and book prize slections will be made by LibraryThing staff, and our decisions are final. LibraryThing staff and family can enter, but can only be honored as prize-less runners-up. Any images you load stay yours, or you can release them under a copyleft license, but we get a standard “non-exclusive, perpetual” right to use them. Questions? Comments? Post them over on Talk. *Surprise books will be chosen by LibraryThing staff from Portland, ME’s indie bookstore, Sherman’s! We’ll make our selections based on the winner’s library/wishlist. This announcement reminded me of a book group I organized long ago: Read ‘em and Eat! We met once a month. Everyone brought food that was somehow related to the book. It was lots of fun . . . though some books were a bit of a challenge My favorite was Divine Secrets of the Ya Ya Sisterhood . . . I made a huge pot of gumbo and everyone else brought yummy things to go with it. Not sure whether any of our meals was worth photographing (and back then no one had cameras/phones attached to their hips), but the meals sure were tasty and we had great discussions while stuffing our faces! I have just taken a peek at this year’s entries. I certainly do not envy the judges having to make a decision this year!